Born in Upton, Nottinghamshire, England, Fiona was into sports as a child, especially gymnastics, horse-racing and ice-skating. She attended Lowes Wong Junior School in nearby Southwell before going to The Rodney School in Kirklington. Later, Fiona worked as an administrator for the RAF where she able to gain experience in flying and gliding. She also opened her own gymnasium, but tragedy struck when her husband, Bill, was killed in a road accident. In 1992, Fiona met her present husband, Mike, who introduced her to outdoor sports such as mountaineering. Mike also had ambitions to cross the South Pole overland, and these plans encouraged Fiona to follow suit. 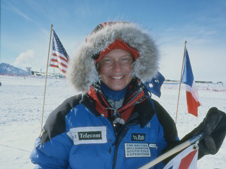 10/1/2004: 1st British woman to ski solo & unsupported - Geographic South Pole. 10/1/2004: Fastest (man or woman) to ski - Geographic South Pole - unsupported in 41 days 8 hours 14 minutes. *Record held jointly with Ms. Catharine Hartley. 2001: R.A.D.A.R - People of the Year. 2004: European Woman of Achievement. 2004: Royal Institute of Navigation - Achievement Award. 2004: Explorers Web - Best expedition of 2004. 2004: Midlander Of The Year.